I want to be a sketch. I just finished reading Was She Pretty? a graphic novel by Leanne Shapton that explores one simple, jealous, unanswerable question. Was she pretty? We ask our current partners. Yes, they say, with only slight hesitation. “But she was…” mitigates it slightly. But you know. Of course she was pretty, otherwise he (or she) wouldn’t have loved her. She was pretty and a dancer and she cooked him thai food every night. She was pretty and a filmmaker who hated blockbusters and could quote Goddard. Most importantly, she simply was. While reading it, I found myself thinking not at all about my boyfriend’s exes. I didn’t think of my ex’s either, and what they must be doing with their new, pretty girlfriends who probably love hiking and are too sophisticated for boxed wine. No, all I could think was: I want to be one. 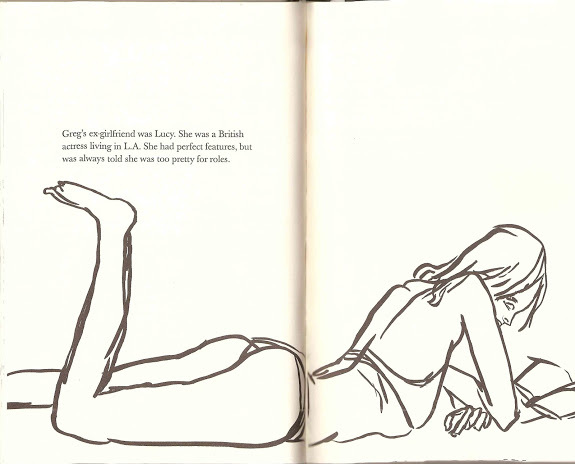 I want to be reduced to a simple, lovely sketch. I want some essence of Katy to be distilled into a black-and-white series of lines and a romantic, mysterious caption. John’s girlfriend Katy liked to drive in barefeet and cut-off shorts. She could roll a joint and smoke it without veering from the center line. (High school). Jake’s girlfriend Katy loved watching horror movies with him. Her skinny arms would wrap around his torso, hungry face hidden in his chest. He stroked her hair and never called her by her proper name. (Or later) Josh’s ex-girlfriend Katy worked best in her own bed and hated staying at his house. She had the most dexterous toes he had ever seen, and loathed it when he made his bed. It’s fun. I don’t sound nearly as romantic as a ballerina or an aristocrat, but with the right sketch, I think I could make someone jealous. Or someone fall in love with my two-line personality, like I did reading Shapton’s words, again, and again. < Previous Bryan Nash Gill turns trees inside-out. Next > Turning paper into water.